Participants : Jérome Béchu [ correspondant ] , Pierre-Yves Oudeyer. The UFlow Toolbox is a collection of various software modules for programming and scripting robot sensorimotor loops, aimed at allowing rapid prototyping in the FLOWERS team, and integrated in the URBI framework. URBI, developed by GOSTAI, supports the integration of heterogeneous robotic software modules. It uses a dynamic scripting language, witch manage parallel and event processing. Each module, called UObject, is written in C++. 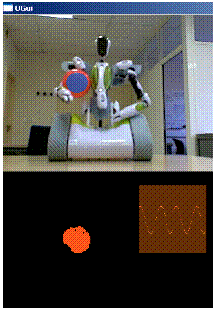 Currently we have developed two UObjects for image acquisition and access: uNetCam and uOcvCam. uNetCam Manages a pan/tilt ethernet camera, this module connect to the camera ip, and acquires image in a streaming flow (accurency 10 fps). We can control in real-time using UrbiScript the pan/tilt movement. The second module to acquire image is uOcvCam. This uobject is use to get image from usb default camera device. An UObject, named UBlob, analyses a image and detects a color blob's position in real-time. To realise this analyse, we have two options, rgb or YCbCr detection. In both, the user have to specify the range of each composant to create a filter. The figure 4 presents the UGui UObject. This component is a graphical interface for Urbi, allowing to manipulate and animate easily graphical forms and superimpose them on other images such as images from the camera. Figure 4. This component is a graphical interface for Urbi, allowing to manipulate and animate easily graphical forms and superimpose them on other images such as images from the camera. Finally, the last UObject developed (in progress) is USpeechAnalysis. This composant is designed to extract in real-time MFCC, Pitch and Intensity from the audio input of computer.